A three-tonne weight restriction has been introduced on Oundle's North Bridge to prevent further deterioration to the historic Grade II listed structure. The proposed three-tonne restriction will be self-enforcing, via the use of a traffic width restriction of 2.1m at each end together with appropriate signage from either direction in a similar system previously used on South Bridge. The county council has agreed to signal the junction of the A605 and Barnwell Road to help ease access on to the A605, which can be difficult. Weight restriction signs were put in from Monday, January 21, while work on installing the width restrictions and traffic lights will start on February 18 and is scheduled to take four to six weeks. Northamptonshire County Council – like other local authorities – has been awarded money (£6.7million) by the Department for Transport for the repair of potholes and minor highways maintenance schemes. 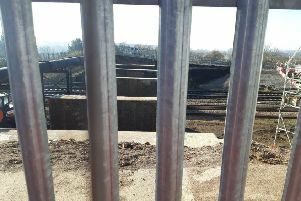 About £1.3million of this is to be used specifically for the repair work on North Bridge in Oundle. Now that money is available, work will continue on working up a design for the scheme and to secure the permissions necessary for the work to take place. Cllr Ian Morris, Northamptonshire County Council Cabinet member for transport, highways and environment, said: “The condition of the structure is deteriorating and whilst there is not an immediate risk of collapse which would result in a full closure, action does need to be taken in the short term to prevent more damage. “We also need to reduce the amount of traffic using the bridge when we undertake the works otherwise we would need to close the bridge. The restrictions on North Bridge will only apply to vehicles in excess of three tonnes and all standard car/motorcycle traffic will not be affected. The three-tonne restriction would allow two-way car traffic to continue over the structure, minimising traffic disruption and delay. Additionally, the existing 18-tonne weight limit on South Bridge, Oundle, will be temporarily revoked to aid movement of HGVs into the town. The actual repair work on the bridge is scheduled for completion by December.